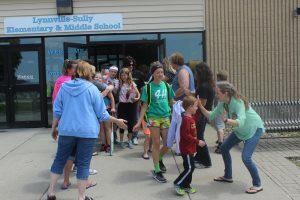 Elementary teachers and staff members form a tunnel outside the school doors to share high fives and hugs as students leave the building for the last time in the 2016-17 school year on Friday, May 26. The last few days at L-S were a whirlwind as students finished up all assignments, cleaned desks and lockers out, and packed up school supplies to take home for the summer. Several fun activities were held over the last week to celebrate another successful school year. Elementary classrooms enjoyed class picnic lunches and an extended time of play at the Sully park, Accelerated Reader parties were held, and much more. Eligible middle school students spent the last day of school at Adventureland in Des Moines, enjoying a day of the thrilling rides and games.